Love Food Hate Waste is one of our biggest campaigns to help reduce food waste in our community, raising awareness of impact of food waste and tips on how to reduce this in our lives. 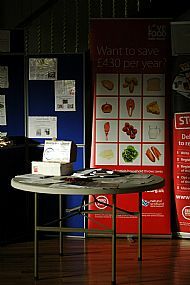 We aim to provide practical advice to all on how to reduce food waste. We can give happily give a presentation on food facts and include interactive games to add to the fun. Did you know that the average household throws the equivalent of a basket full of food each week? Stopping food waste is equal in carbon emissions of taking 1 in 4 cars off the road. An average household in Scotland could save £470 by eliminating food waste. A single occupancy household wastes £310 per year due to food waste. Or visit their excellent Facebook page for more ideas!